The Luftwaffe, with its Raketentruppe (Rocket Troops) and Fallschirmjäger (Paratroopers) is on the horizon... And they come with a bang! This new weapon set is dedicated to this elite fighting force with all their new weapons: assault rifles, rocket launchers, flamethrower, support weapon, you name it! 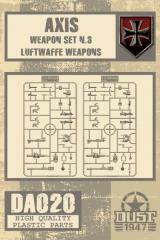 Reinforce your Axis forces with this weapon set now!